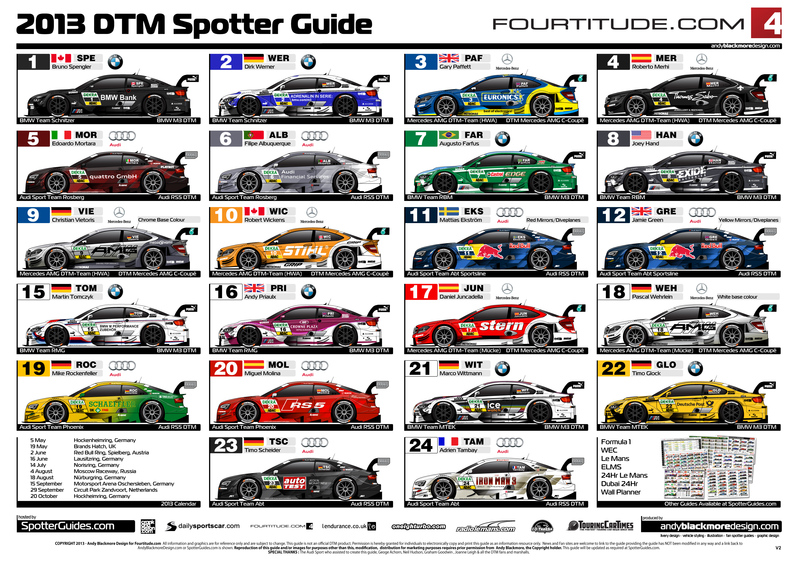 The 2013 DTM Spotter Guide, presented by Fourtitude.com is now online and updated for Round 3 at the ‘Red Bull Ring’, Austria, for you to download. The guide features all 22 entries with car, livery and driver detail including the three letter Driver ID. With the Champions league final this weekend Mercedes and Audi have Football fever. Miguel Molina (#20) retains his Audi Cup/Bayern Munich livery from Brands while Mercedes Benz AMG are fielding VFB Stuttgart livery on Pascal Wehrlein’s (#18) machine. One further change. Adrien Tambay has reverted back to his Audi Ultra livery. The guide will be updated during the year as any driver or livery changes occur. Click on the Image to download your 3000 pixel guide. Its 3Mb, so may take a while to download. Dont forget our other guides including the Nismo WEC and ELMS Spotter Guides, the Official Spotter Guide of the ALMS and Formula One. Don’t forget to download the 2013 Wall Planner with all the major race dates. Special thanks to Fourtitude.com for sponsoring the this guides during 2013 and Audi Sport for their valuable assistance in creating the guides. Feel free to thank them on Twitter. @Fourtitude and @Audi__Sport . Also, thanks to our media partners, Crank and Piston, l’Endurance.co.uk, TouringCarTimes.com, Oneighturbo.com, Radio Le Mans and our hosts, Ten-Tenths.com. Thanks to everyone who has downloaded any guide, if you are a racefan, corner worker, official or commentators. Many thanks for your continued support.